Last week we looked at Manon Rheaume's cup of coffee in the NHL and she has only one person to thank for her NHL appearance and they are the subject of this week’s autograph. True, Manon has had many factors and influences that turned her into one of the best female goalies on the planet during the 90's, but it was Phil Esposito who thought it would be a good idea to give her a chance to play for the Lightning. While Phil may wish to forget his time as an NHL GM, he did impact the game significantly both as a player and as a GM. As a player, there were very few better than the 10-time all-star. He blew the NHL records out of the water in 1970-71 when he scored 76 goals and 152 points. That season, Phil’s 76 goals were 18 goals higher than the previous record of 58 by Bobby Hull. What I really appreciate about Phil’s legacy is no player had ever beaten the previous goal scoring record by as much as Phil did. Even when Wayne Gretzky scored 92 goals, he only eclipsed Phil’s total by 16. During that same season, Phil set an NHL record for shots on goal in a season with 550, which still stands and the NHL record for points in a season with 152 (26 higher than the previous record). While the points total would eventually fall, Phil’s career totals still remain near the top to this day. 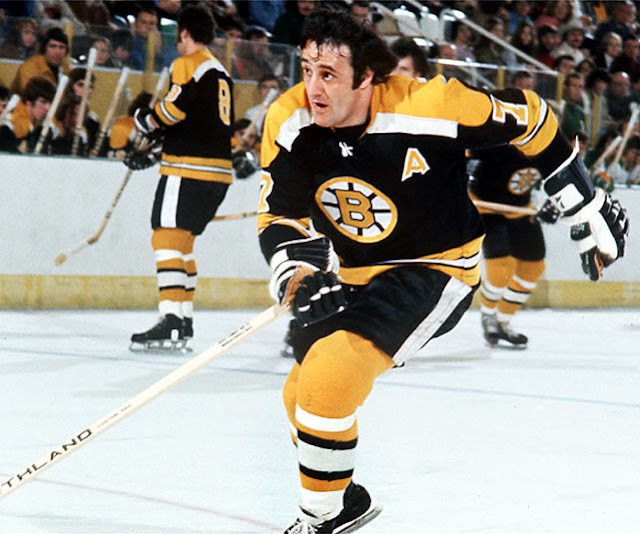 During his career, Phil Esposito would score 717 goals and 1590 points which are good enough for 5th and 10th respectively as of today. Only Jaromir Jagr and Teemu Selanne are threats to his 5th spot in goals and they are both a solid 40+ goal scoring season away from catching him. Phil is often best remembered for what he did for his country rather than what he did in the NHL. During the ’72 Summit Series, Phil was the voice of the players and he nearly single-handedly took a team that was low in morale and turned the series around. I personally think it was his speech after game 4 and his stellar play (4 goals and 2 assists) in games 7 and 8 that cemented the win for Canada. Love him or hate him, Phil has played a huge role in hockey both in the NHL and internationally and certainly is one of the best to have ever played the game! 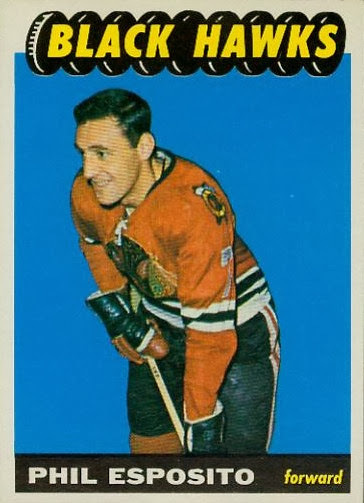 Like many of the cards I share on here, I don’t own a Phil Esposito rookie as of yet. This is a fine example of what one looks like. The book value on this 65-66 Topps card is $400 dollars which is pretty decent given the age of the card and how good Phil was as a player. 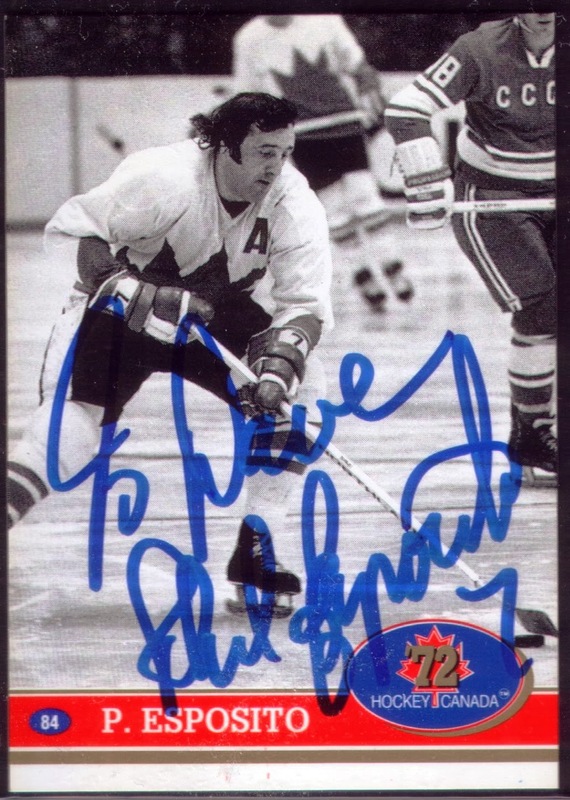 Like my Ken Dryden auto, I elected to send along a card from the 91-92 Future Trends ’72 Summit Series set which Phil signed with the inscription “To Dave”. This return took over a year, but was totally worth the wait. 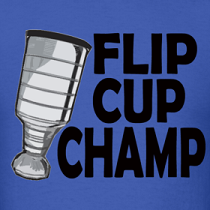 I have much respect for what Phil has accomplished in his career and this card will be enjoyed by me for many years to come. Thanks Phil! Must be such a great feeling when you forget about some cards you sent off and then they come back a year later.